The order to stand up during the national anthem is a judge-made law without prescribing the nature of punishment for its violations. In the absence of nature of punishment and the interim directions, the police are resorting to Sections like 188 of the Indian Penal Code, in addition to Section 3 of Prevention of Insults to National Honour Act, 1971. Around 20 persons have been arrested so far for allegedly failing to stand while the national anthem was being played at cinema halls, two weeks after the Supreme Court made it compulsory and just within three days of the order being made operative. The Supreme Court had on 30.11.2016, through an interim order in a PIL by one Shyam Narayan Chouksey issued seven directions to be complied with nationwide, including that the audience should mandatorily stand while the anthem shall be played before the screening of feature films with the national flag in the backdrop. The decision of the apex court had met with strong reactions from civil liberty activists and lawyers and a recall application filed by Kodungallur Film Society was recently admitted by the court and posted for hearing with the main matter, while issuing two modifications/clarifications and agreeing for a larger debate. 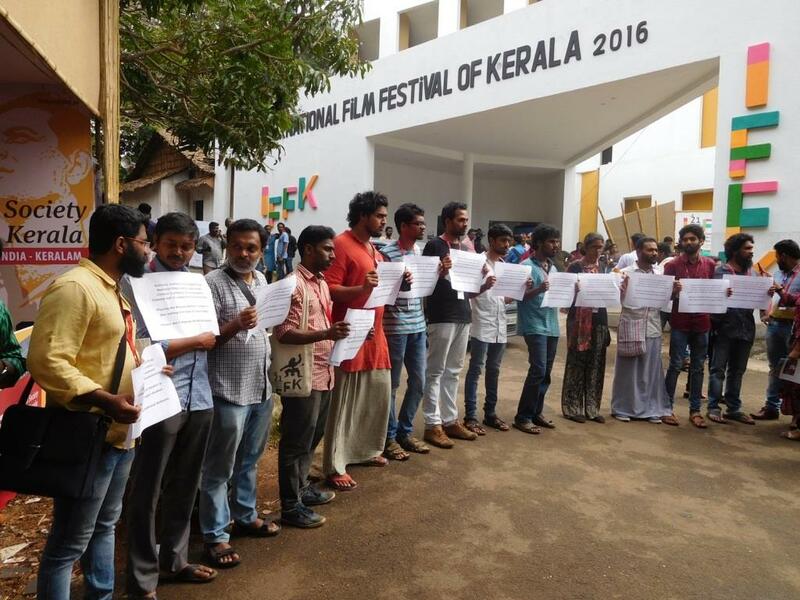 It has been reported that 12 people were arrested on Tuesday at the International Film Festival of Kerala (IFFK) in Thiruvananthapuram for failing to observe the order. 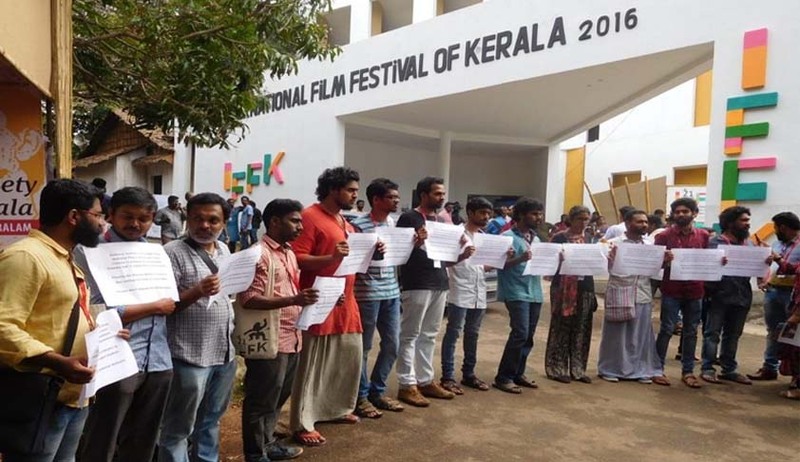 The film-goers, who have not been identified, had reportedly refused to stand after being asked to do so by the organisers, and the police, even without receiving a complaint have charged them with various related offences in the absence of any direction to the law enforcement agencies. This has led to statewide protests. A placard held by protesters at Tagore Theatre, the main venue of the ongoing festival, reportedly read: "The national anthem is not a digital song. National flag is not an audio visual. Cinema is primarily an entertainment. Cinema hall is a place to sell entertainment". Other posters read: "Please don't degrade my national anthem" and "We love Bharat. Nationalism cannot be imposed." Earlier on Sunday, eight persons were arrested at a cinema hall in Chennai in Tamil Nadu after being reportedly assaulted by a group of 20 men during the interval for allegedly refusing to stand. They were reportedly charged under the Prevention of Insults to National Honour Act, 1971, and may face up to three years in jail, if found guilty. Interestingly, the Supreme Court has not specified a penalty for failure to stand, or indicated who was to take charge of monitoring rule-breaking and assigning punishment and a categorical mention can be found in the pending application seeking recall of the said order to that effect. It is pertinent to note that Section 3 of the said Act does not penalise anyone for not standing up at all. It only penalises if somebody voluntarily disturbs playing or attending of the national anthem. It is learned that the police are in utter confusion regarding the offences to be charged. The order to stand up during the national anthem is a judge-made law without prescribing the nature of punishment for its violations. In the absence of nature of punishment and the interim directions, the police are resorting to Sections like 188 of the Indian Penal Code, in addition to Section 3 of Prevention of Insults to National Honour Act, 1971. Since the punishment is not prescribed and since it is a violation of a court order, there is likely that all persons would be prosecuted for contempt of court under the contempt of courts Act. The application of Section 188 of the Indian Penal Code, now being resorted to, has its own legal challenges. The section deals with disobedience to order duly promulgated by public servant. “20. Section 195(a)(i) CrPC bars the court from taking cognizance of any offence punishable under Section 188 IPC or abetment or attempt to commit the same, unless, there is a written complaint by the public servant concerned for contempt of his lawful order. The object of this provision is to provide for a particular procedure in a case of contempt of the lawful authority of the public servant..."
Since such a scenario is not available, the application of the Section shall not withstand a legal scrutiny. As mandated by the interim order, the Ministry of Home Affairs has vide order dated 06.12.2016, issued a communication to all states notifying the order. The Supreme Court has posted the matter for 14.02.2017, but incidents being reported across the country show that the directions are acting as a tool of oppression in the hands of anthem vigilantes practicing symbolic nationalism. Given the trend, it is going to be a tough period for law enforcing agencies to keep a vigil on people inside the theatres to see that the Supreme Court directions are followed in letter and spirit.